Thomas Dekker’s impressive psychological thriller Jack Goes Home is the latest in a new wave of American horror films that get much of their tension from questioning the reliability of their protagonist’s view. Like Jacob’s Ladder before it, Jack Goes Home is an exploration of trauma that utilizes horror tropes and imagery to bring viewers closer to its protagonist’s headspace. 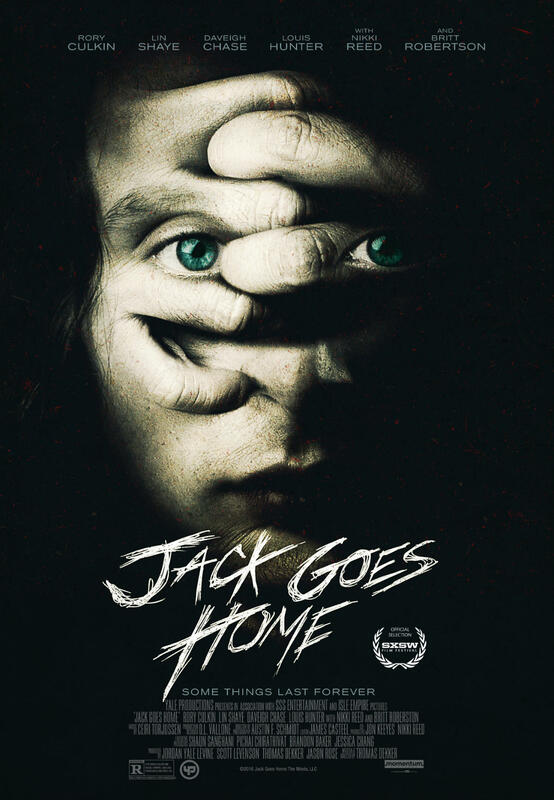 But Jack Goes Home is unique in its aesthetic, forgoing the usual shadowy color palette and obvious sound design so common in modern haunted house flicks in favor of bright suburban spaces and striking cinematography that has as much in common with Dekker’s past collaborator Gregg Araki as any Amityville remake. Smartly constructed and shot, Jack Goes Home doesn’t necessarily break new ground but Dekker’s direction is so confident and his aesthetic sense so well honed it feels like a completely unique horror experience. Rory Culkin plays the eponympus Jack with smug ferocity, causing the viewer to see him as a prickly but stable and confident young man, making his eventual terror all the more palpable. Jack works for a magazine and is expecting a baby with his wife but is forced to go home after his parents are in a horrible car accident. Jack Goes Home avoids featuring a specific villain and instead focuses on the complicated relationship between Jack and his seemingly unhinged mother, played by the underrated character actor and horror icon Lin Shaye. At first Jack’s mom’s behavior seems like the standard monstrous grief of someone who has lost their partner, but the longer Jack is in his childhood home, the more it seems like darker forces are at work. Dekker does excellent work maintaining suspense over Jack’s stability, beginning with an early scene of foreshadowing that has Jack sleepwalking and making creepy statements about something in the attic to his childhood friend Cleo (Britt Robertson). By the time Jack gets to his childhood home, the question of what is and isn’t real in the film becomes more difficult to answer. Though Culkin is an excellent and engaging lead, Shaye has the hardest job in the film, constantly straddling the line between grieving and demented, and as deeply hidden secrets from the family’s past emerge, that line becomes all the more strained. Jack Goes Home isn’t technically a horror film, but what Dekker has produced is an intense and frequently horrifying experience, touching not just on the grief that comes from the loss of a parent, but also repressed memories and survivor’s guilt. Like prior SXSW standouts Oculus and The Invitation, Jack Goes Home is best when you enter into it without much prior knowledge, and also warrants a second viewing to better understand what exactly is happening. But even beyond its narrative twists, the film packs a number of character-based surprises, specifically the film’s exploration of Jack’s bicuriosity, which drives home the Araki influence as much as the unusually vibrant visuals do. Dekker has created a rare stand-out horror film that also announces its director’s ability to shine in other genres, and it’s all the more impressive for how the genre shifts never distract from the film’s suspense. The film’s curiosity motif acts as an especially strong glue binding together Dekker’s myriad interests but there’s also no denying Dekker’s commanding confidence as a director. Jack Goes Home is a great achievement that hopefully indicates the start of a bold new talent in cinema. Portions of this review originally ran as part of Loser City’s SXSW 2016 coverage earlier this year. Morgan Davis sells bootleg queso on the streets of Austin in order to fund Loser City. When he isn’t doing that, he gets complimented and/or threatened by Austin’s musical community for stuff he writes at Ovrld, which he is the Managing Editor of.